One of India's most famous hill stations, Shimla is called the Queen of Hills. It is situated as 2130 meter above sea level, In 1864, the Britisher made it the summer capital of India. In 1903m the Kalka-Shimla railway line was formerly the capital of Punjab before it became the capital of Himachal Pradesh in 1966. Shimla is named after its local Goddess Shyamala (Goddess Kali). 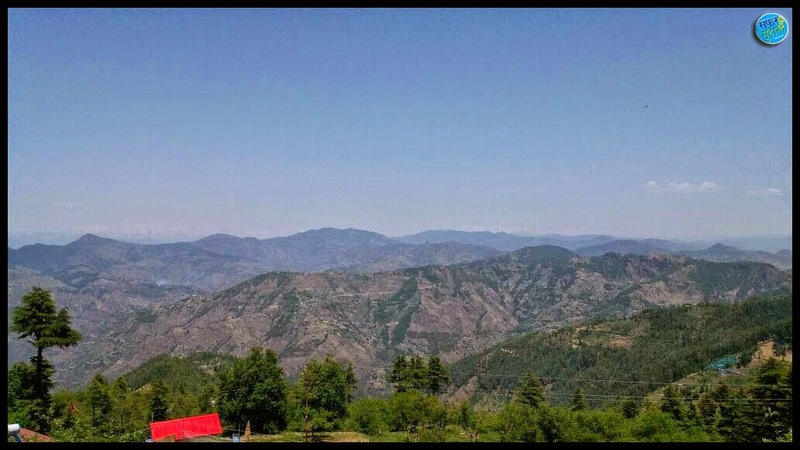 Its green valley, the beauty of its trees, pine, oak and deodar, golf facility in the lap of nature at Naldehra and skiing at Kufri and Narkanda attract the tourists throughout the year. Indian Airlines and Jagson Airlines services connect Jubbar-Hatti Aitport (23kms) with Kullu and Delhi. Shimla is connected by a narrow gauge line with Kalka (96Kms) which in turn is connected with the major cities in India, The toy train journey from Kalka to Shimla is entrancing with 107 tunnels and lofty arched bridges. Regular bus service connect Shimla with Chandigarh 117 kms, Kullu 220 kms, Mandi 150 kms, Pathankot 380 Kms, Ambala 151 Kms, Chail 45 Kms, Dehradun 240 Kms, Dharmshala 235 Kms and Dalhausi 336kms. The Mall (मॉल रोड) → This it the main shopping center of Shimla with restaurants. The Gaiety Theater, on the mall is a reproduction of an old British theatre is a center of cultural activities. The Ridge (रिज ) → This is main place of Shimla nearby Mall Road. The large open space in the heart of town present excellent view of the mountain ranges & green deep valley. Christ Church (चर्च) → Built in 1846-1857, Christ Church is the Second oldest church of northern India, built in 1846-1857. The Church's exquisite beauty comes with the stained glassed that are fitted on its windows. Himachal State Museum & Library (3 Kms) हिमाचल राज्य संग्राहालय और पुस्तकालय → The museum opens daily exept on Monday and pubilc holiday. It has got a good collection of ancient historical sculptures, painting, coins, photos and other items from all over the state as well as outside it. It has also got a library, which houses many historical books and manuscripts. Jakhu Hill (जाखू हिल ) → Shimla's highest Peak , this is situated 2Kms from the town. One can have a breathtaking view of Shimla from here. A Hanuman temple is also found on this peak. Viceregal Lodge & Botanical gardens (4 Kms) बोटनिकल गार्डन → This magnificent building was the residence of the British Viceroy Lord Duferin. This lodge was complete in 1988 and it is said that every brick for the building was carried by mules. This is a six - storey building and is surrounded by well maintained gardens and lawns. The lodge has now been converted into institute of Advanced Study. Prospect Hill (प्रोस्पेक्ट पहाड़ी )→ It is crowned by temple dedicated to Kamna devi. sunrise and the moon are spectacular sight from here. Summer hill (4 Kms) समर पहाड़ी → This hill is a picturesque spot on Shimla - Kalka Railways line offering shady walks in quiet surrounding. It has a beautiful temple of Goddess Maa Taradevi. The Glen (4 Kms) → This is a thickly wooded ravine through which a stream flows. It is a popular picnic spot of Shimla. 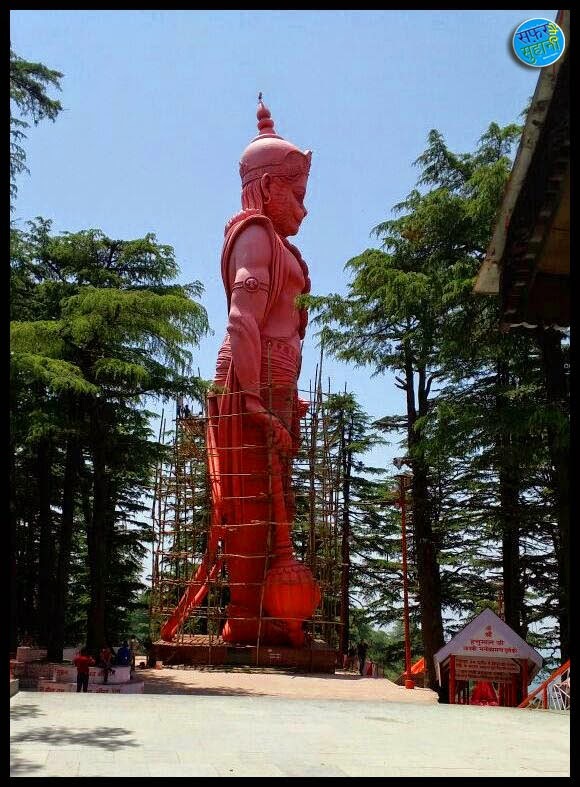 Sankat Mochan Temple (संकट मोचन मंदिर) → This temple is dedicated to Lord Hanuman ji and 7 Kms away from Shimla city. Mashobra (12 Kms) मशोरबा → At 2149 Meters above sea level, this beautiful suburb is surrounded by thick forest. From here, a track leads down to Sipur which is an exquisite glade shaded by ancient deodar trees. There are old temples on a side and a fair is held every April. Himalayan Bird Park (हिमालय पक्षी उद्यान ) → This Park is a natural habitat of numerous species of rare birds found in Himachal. This park is situated 11 km. away from the Mall road of Shimla. Chadwick Falls (7Kms) चैडविक झरना → This is an ideal picnic spot, it is surrounded by thick forest and waterfalls. Kufri (16 Kms) कुफरी → Kufri is also called the "Chinese Bungalow". Many games are organized here from February to March. In winter one can ski on its snow-covered slopes and it the summer have a raid on the back of the Yak. 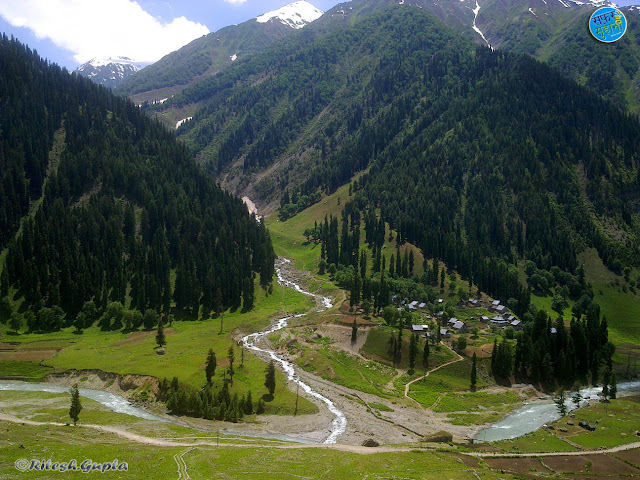 Kufri is well known for its natural scenic beauty. Naldehra (22 Kms) नलदेहरा → It has the oldest golf course in India. The pine and deodar add to its beauty. Fagu (22 Kms) फागू → It is located 2510 meter above sea level, Winter is extremely beautiful here. Dense forest and apple orchards have their unique attraction. The snow-capped mountain can hold anyone spell-bound. Chail (45 Kms) चैल → Another scenic spot where the river Asani flows. This adds to its beauty. The world's higest cricket field is situated here. A story goes that due to some differences, the British had forbidden the Maharaja of Patiala from going to Shimla. Therefore, he laid the foundation for the town of Chail and since he loved the game of cricket, a field was specially laid. Tattapani (51 Kms) तत्तापानी → At 656 meter sea level, there are hot sulfur springs here. It was the information about Shimla. I hope, You will love this post very much. It will be helpful to your Shimla Tour. Now this time to close this post. Awaiting your comment. Best of Luck for your Next Trip. Thanks for sharing this useful post. I really liked your post. The past seamlessly blends with the present at certain places to visit in Shimla and this is especially true for those Shimla places to visit, which date back to the colonial era. Some such places are Christ Church, Viceregal Lodge, and Observatory Hill. Of course, it goes without saying that nature offers the most popular spots for sightseeing in Shimla, with Shimla Glen, Tattapani, and Himalayan Bird Park being just a handful of such wonderful Shimla attractions. Check out all best places to visit in Shimla. Thanks for Wonderful comment & information. Beautiful place and beautiful people. Shimla is wonderful place for the tourist where one can spend their valuable time. The place is easily visited from http://bit.ly/2hUgyfE here. One can spend their sufficient weekend on this place.